You may recognize this picture. Then again, maybe not. 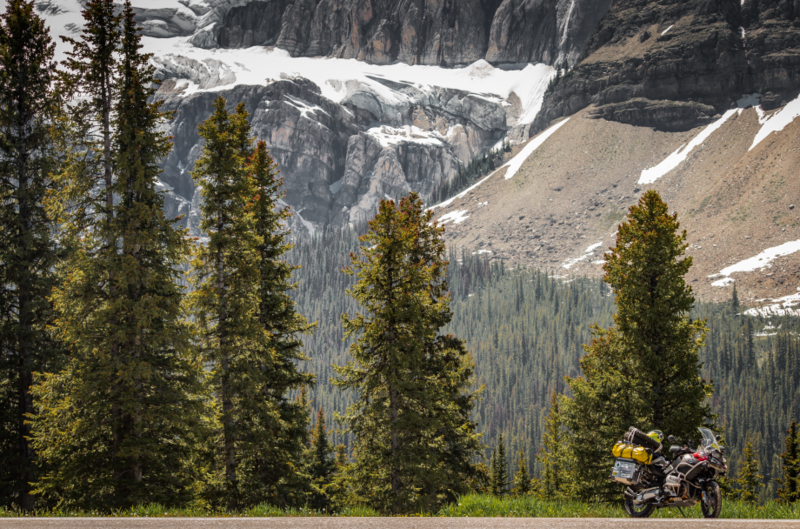 I took this shot of my bike along the side of the Icefields Parkway in Alberta, Canada back in 2013 as I made my way to Alaska. That is a glacier working its way down the mountain in the background. What you don’t see is how I took the shot. There really isn’t anyplace to stand at this location across the road from where the bike is parked. So had to stand down on a narrow ditch, right near the edge of the Parkway. Cars were passing past me and this had to be a quick shot, since I didn’t want any cars in my picture. So as I often do in many of my shots, I ran across the road and found just enough time to click off a shot or two before traffic filled the screen. This is a hand-held shot, not a tripod shot. For whatever reason I’ve found that many if not most all of my best pictures are taken in a kind of spur of the moment with no or at least very little pre planning. I don’t know why, but the shots I take that involve planning and lots of setup usually don’t come out to good. So as I lay here in bed tonight I thought I would share a little tidbit with you tonight. More to come soon. And thanks for viewing.